There’s a new pair of the infamous white headphones in town. Hands up who’s been impatiently waiting for Apple’s in-ear headphones to arrive since Mr Jobs announced them back in September? 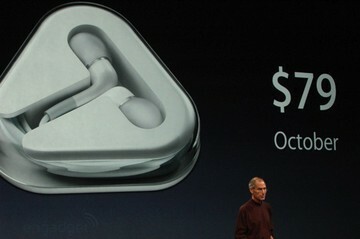 As you’ll notice from the massive slide behind a tiny Steve Jobs, they were promised for October. Clearly that didn’t go to plan, but the good news for discerning listeners and Apple fans is, the wait is over – they’re here. Each ear boasts two drivers – a woofer and a tweeter – and you’ll be supplied with three earbuds (small, medium and large) to guarantee at least one of them fits the contours of your ear. Or if your ear wax consists of some kind of acidic substance that happens to melt one set of earbuds, you’ve got two as back up. There’s also a built-in mic and remote. Surprisingly, the headphones aren’t compatible with Apple’s most famous device. Yep, the iPhone, which is a little disappointing for iPhone owners, but great news for everyone else. At $79 USD these babies aren’t cheap – but hey, they are white. Get a pair here.